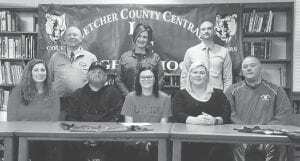 Letcher County Central High School student Abby Meade, daughter of Mitchell and Crystal Meade and granddaughter of Ricky and Sherry Lucas of Whitesburg, has signed to play softball at the University of Pikeville. Pictured are (top, left to right) LCC athletic director Michael Melton, LCC Principal Gracie Maggard, LCC Asst. 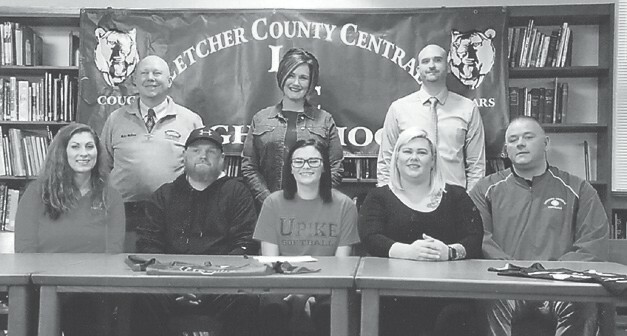 Principal Rodney Craft, (seated) UPike coach April Damron Cranes, Mitchell Meade, April Meade, Crystal Meade, and LCC softball coach Jay Perkins.